If your loved one is an ADRENALINE seeker who is into fast cars, smoking and screeching tyres…then we’ve got the perfect gift idea for you! They can undertake a Drift School lesson (Drift Experience Intro, Drift 101, Drift Masterclass) in perfecting the drift entry, with training to balance the angle, transferring weight and steering, all under high speeds. They can experience a high speed Drift Battle where they jump in the passenger seat of one of our competition drift cars as two pro-drift drivers perform identical high speed drift moves at incredibly close quarters to simulate a real Battle! 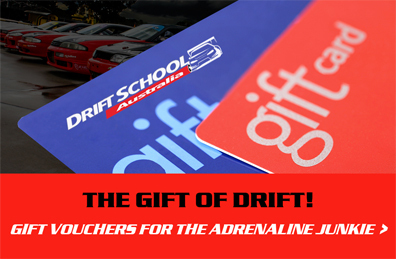 Gift vouchers are available in $100, $250 or $500 value or you may buy a specific product as a gift voucher (please go direct to the product to buy gift vouchers for Thrill Rides (from $59), Drift Experience Intro ($199), Drift 101 ($395), Drift Masterclass ($749).